Discussion in 'Femmes' started by CharlottefromCA, Jul 20, 2009. Wow, she JUST turned 14..
her age really shows in the polaroids, well I am hoping she makes it big someday, but maybe a bit later, like a couple of years, she has plenty of time. 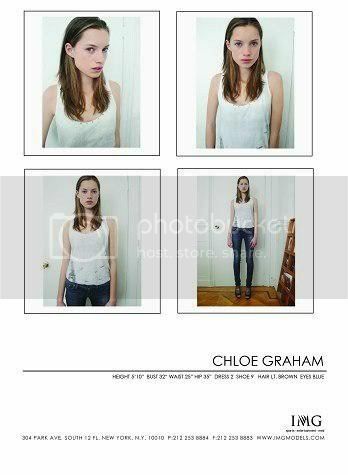 Chloe has had international interest from Woman Models Management Paris, Metropolitan Models Paris, Supreme Models New York, Image Models Tokyo and IMG models New York, and that’s just from looking on the website - this 5’91/2” stunner is a force to be reckoned with. ahaha the suprise i got when i saw my sister's name on the thread list! not thinking how common the name chloe is! and the fact she's 12. First thing I thought was, baby Doutzen. wow she's just like doutzen! That's exactly what I was thinking, she looks just like Doutzen! The best thing about Chloe is her personality actually! She's really down to earth and a little bit tomboyish! oh just found her thread, has she been up to anything recently? Signed with IMG New York!